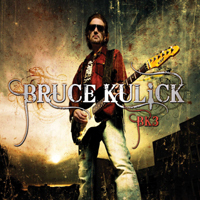 ’BK3’ is the title of the brand new solo release by Bruce Kulick (KISS, MEAT LOAF, GRAND FUNK<?xml:namespace prefix = o ns = "urn:schemas-microsoft-com:office:office" /> RAILROAD) and an album that I have mixed feelings about. Fans of Bruce should not worry... it’s a solid album and everything is well played and well produced but I miss something. I miss a real hammer track. A track that will knock your socks off. Everything is on the exact same level except for the very first track “Fate”. And it seems to me like Mr. Kulick can’t decide in which direction he will take his music. Should he stick to the heavier side of rock, or go all soft on us? But it’s nice that he’s still around and this CD is a solid one. I just don’t feel like playing it over and over again.